Happy February! We survived last week's 36 inch blizzard. Yep you heard right, we got 36 inches over two days. School was cancelled for the week and the big dig out was upon us. Life has started to resume as usual this week with warmer temps allowing a lot of snow to melt. I was happy to get back into the "stamping swing of things." 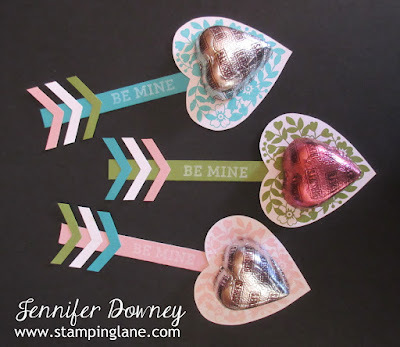 This month's blog hop is all about love. Couldn't be more appropriate right? It's the time for sweet valentines and chocolate candy treats. For my valentine, I highlighted one of the fabulous new bundles in the Occasions catalog, Bloomin' Love. Instead of the traditional valentine colors of red, pink and white I decided to be more 'springy' in my selection and chose Old Olive, Bermuda Bay and Blushing Bride. Besides the different color choice, I also made it more interactive. Consider it an onion where you peel back the layers. Here is the onion as a whole. Peel back one layer (i.e. the main front flap on the right opens up) to reveal another layer of the card underneath. That layer then flips up to reveal the actual inside card of the card. Too fun right? Yep, it's an "onion" valentine! My chocolate candy treat is more straight forward. It's my ode to "Cupid's Arrows". I stamped that same heart I used on the front of the card and hand cut it out. I used my trusty Hexagon punch to create the "feathers" on the the end. And why this arrow is cute, it's even cuter in different colors! Voila! I made one in each of the three colors I used on the card above - Bermuda Bay, Old Olive and Blushing Bride. I attached chocolate hearts to each one. I hope you enjoyed your stop here today! Depending on where you started on our hop you can either go back and see what creative genius Elizabeth has for you or you can move along to see what awesome stamping skills Holly has to share with you today. Happy Stamping! Look at those cute little arrows with hearts. Just adorable. Also love your card, especially the refreshing color scheme. Card is beautiful & treats are adorable! TFS! Beautiful card! Love the colors you picked, so pretty together. And the arrows are just the sweetest, fabulous idea! Great projects! Those arrows are such such a cute idea!